Pahela Baishakh is the first day of the Bangla year. Pahela Baishakh is celebrated in a festive manner in both Bangladesh and West Bengal . In Bangladesh Pahela Baishakh is a national holiday. Pahela Baisakh falls on April 14, each year. Under the Mughals, agricultural taxes were collected according to the Hijri calendar. However, as the Hijri calendar is a lunar calendar, the agricultural year did not coincide with the fiscal. As a result, farmers were hard-pressed to pay taxes out of season. In order to streamline tax collection, the Mughal Emperor Akbar ordered a reform of the calendar. Accordingly, Fatehullah Shirazi, a renowned scholar and astronomer, formulated the Bangla year on the basis of the lunar Hijri and Bangla solar calendars. The new Fasli San (agricultural year) was introduced on 10/11 March 1584, but was dated from Akbar’s ascension to the throne in 1556. The New Year subsequently became known as Bangabda or Bengali year. Celebrations of Pahela Baishakh started from Akbar’s reign. It was customary to clear up all dues on the last day of Chaitra. On the next day, or the first day of the New Year, landlords would entertain their tenants with sweets. On this occasion there used to be fairs and other festivities. In due course the occasion became part of domestic and social life, and turned into a day of merriment. The main event of the day was to open a halkhata or new book of accounts. This was wholly a financial affair. In villages, towns and cities, traders and businessmen closed their old account books and opened new ones. They used to invite their customers to share sweets and renew their business relationship with them. This tradition is still practised, especially by jewellers. Kavigan, Jarigan, Gambhira Gan, Gazir Gan and Alkap Gan. They present folk songs as well as Baul, marfati, Murshidi and Bhatiali songs. Narrative plays like Laily-Majnu, Yusuf-Zulekha and Radha-Krishna are staged. Among other attractions of these fairs are puppet shows and our very own merry-go-rounds. Many old festivals connected with New Year’s Day have disappeared, while new festivals have been added. With the abolition of the zamindari system, the Punya connected with the closing of land revenue accounts has disappeared. Kite flying in Dhaka and bull racing in Munshiganj used to be very colourful events. Other popular village games and sports were horse races, bullfights, cockfights, flying pigeons, boat racing. Some festivals, however, continue to be observed, for example, bali or wrestling in Chittagong and gambhira in Rajshahi. Bengali dresses: young women wear white sarees with red borders and adorn themselves with bangles, flowers, and tips. Men wear white pyjamas or dhoti and kurta. Many townspeople, start the day with the traditional breakfast of panta bhat (cooked rice soaked with water), green chillies, onion, and fried Hilsa fish. The most colourful new year’s day festival takes place in Dhaka . 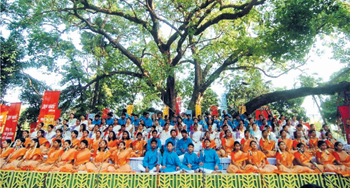 Large numbers of people gather early in the morning under the Banyan Tree at Ramna Park where Chhayanaut artistes open the day with Tagore’s famous song, Eso he Baishakh eso eso (Come O Baishakh, come), welcoming Baishakh. A similar ceremony welcoming the new year is also held at the Institute of Fine Arts , University of Dhaka . Students and teachers of the institute take out a colourful procession and parade round the campus. Social and cultural organisations celebrate the day with cultural programmes. Newspapers bring out special supplements. There are also special programmes on radio and television. The historical importance of Pahela Baishakh in the Bangladesh context may be dated from the observance of the day by Chhayanaut in 1965. In an attempt to suppress Bengali culture, the then Pakistan government had banned Tagore songs. Protesting this move, Chhayanat opened their Pahela Baishakh celebrations at Ramna Park with Tagore’s songs welcoming the month. The day continued to be celebrated in East Pakistan as a symbol of Bengali culture. After 1972 it became a national festival, a symbol of the Bangladesh nationalist movement and an integral part of the people’s cultural heritage. The nation on Tuesday (April 14) welcomed Bangla New Year 1416 with a renewed vow to establish an enlightened society free from hostilities, darkness, exploitation and all sorts of narrowness. Pohela BoishakhIn the morning on the day, Prime Minister Sheikh Hasina exchanged New Year’s greetings with the members of her cabinet, leaders and workers of the ruling Awami League and its associate bodies as well as a cross section of people at her official residence at Jamuna. Many others also exchanged greetings of the Bangla New Year (Pahela Baishakh) with the premier at the same venue. The tiny tots presented a cultural show on the lawn of Jamuna which was also participated by Sheikh Hasina. Pahela Baishakh, the Bangla New Year’s day, was heralded and welcomed in the city at Ramna Batamul at dawn by the reputable school of music Chhayanaut with the recital of traditional musical instruments. That was followed by rendering of solo and chorus songs of peace, love, affection and patriotism by nearly 200 students and teachers of the institute. Tens of thousands of people from all walks of life attired in colourful and traditional Baishakhi dresses converged on Ramna Batamul in the sprawling Ramna Park from all the directions of the city to be present at the yearly commemorative function amid unprecedented security blanket spread over the entire area and its adjoining places since Monday night. Recalling the sad memories of the militant attack at the venue in the year 2001 that left scores of people and connoisseurs of music killed, one of the founders of Chhayanaut and its principal Dr Sanjida Khatun, in her concluding remarks, observed that by reaching the lights of learning and with the enlightenment of society, the nation could avoid fanaticism, barbarity and all sorts of darkness. The musical soirée was telecast live from the venue, which was the day’s main attraction in the capital. In welcoming the New Year, the Institute of Fine Arts of Dhaka University brought out a colourful march from its campus in which hundreds of marchers took part carrying artistic folk objects. Many of them, particularly students, wore masks of animals, birds and fishes, while many others painted their chic with colours, which attracted the onlookers. Carrying banners, placards and posters inscribed with the slogans of the ruling Awami League for changing the people’s lot for better days ahead, hundreds of marchers wearing head bands paraded Nawabpur Road and Syed Nazrul Islam Sarani (NorthSouth Road) and ended the procession at party central office at Bangabandhu Avenue. Some tastefully decorated horsedriven carriages and push carts bearing Awami League’s poll symbol ‘boat’ also took part in the colourful march in which Awami League central leaders including Obaidul Quader MP, Abdul Mannan MP and Mofazzal Hossain Chowdhury Maya took part. New Year’s cultural functions also were held at the road island in front of the Teachers Students Centre, Arts Faculty Building and Public Library of Dhaka University, Rabindra Sarobor amphitheatre at Dhanmondi, on the premises of Jatiya Press Club and Dhaka Reporters Unity, Lalmatia Government Girls High School, BSCIC Bhaban at Uttara, Waise Ghat in the old city and other places in the metropolis, which attracted hundreds of people throughout the day. This year’s Pahela Baishakh celebrations, in fact, spread to almost all corners of the metropolis, marking a shift from the concentration in the past years on the greater Nilkhet area. However, the entire Dhaka University area and its adjoining public places like Suhrawardy Udyan and Ramna Park were overcrowded with thousands of people clad in different Baishakhi dresses and soon the area turned into a human sea. On the occasion, Baishakhi fairs also were organised at many places in the city including Bangla Academy, Shishu Academy and Dhanmondi Playground, where items of handicrafts, sweetmeats and other products were on display. Other social and cultural and institutions also welcomed Pahela Baishakh with programmes like musical soirees, poetry recitation sessions, discussions, staging street dramas, screening of films and classical music recitals. The organisations included Sammilito Sangskritik Jote, Rishij Shilpi Goshthi, Dhanmondi Recreation Club, Surer Dhara, Bulbul Lalitkala Academy, Bangla Department of Dhaka University etc. The thoroughfare between Foreign Office and Shahbagh Intersection was decorated with festoons inscribed with the New Year’s greetings. The day was a public holiday. National dailies published special supplements while Bangladesh Betar, Bangladesh Television and private radio and television channels aired special programmes highlighting the significance of the day. Businessmen opened new account books (Hal Khata) and distributed sweetmeats among their customers and admirers on the occasion. Meanwhile, hundreds of people converged on the DC Hill in the port city of Chittagong and at Edward College ground in Pabna to take part in the cultural functions of different groups organised on the occasion of the Bangla New Year. On the other hand, police arrested 82 pickpockets along with 36 stolen mobilephone sets during the Bengali New Year celebrations on Tuesday. Of the cellphone sets, 26 were returned to respective owners. Besides, 37 children who went missing during the Pahela Baishakh celebrations were rescued by patrols and later 36 of them were handed over to their guardians while one disabled child remained under police custody.